Countdown released the Countdown to 2015 Decade Report (2000-2010) at its 2010 international conference, which took place in Washington, D.C. in conjunction with the June 2010 Women Deliver conference. The report takes stock of progress on maternal, newborn, and child health in the first ten years after the establishment of the Millennium Development Goals (MDGs). Country profiles for the 68 Countdown countries were published together with the report. The report’s key findings were summarized in an article published in The Lancet in June 2010. 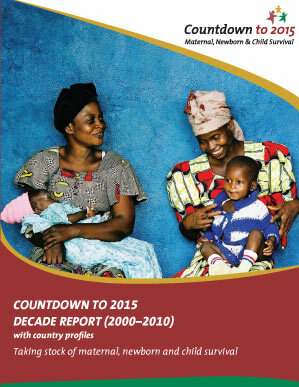 Its key messages include some good news — for example, that at the time of the report 19 Countdown countries were on track to achieve MDG 4 (Reduce child mortality), and 47 had accelerated progress since 2000. But the report also emphasizes that much work remains to be done: in most Countdown countries, progress on health outcomes, coverage of key interventions, equity, health policy reform, and financing has been far too slow, and concerted action is needed.